In prepared remarks, acting Attorney General Matthew Whitaker said Friday there’s been no change in the “overall management” of special counsel Robert Mueller’s ongoing Russia investigation. “I have and will continue to manage this investigation in a manner that is consistent with the governing regulations,” he wrote. 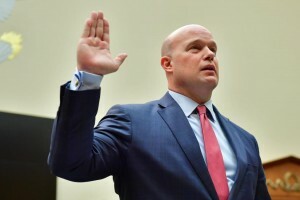 Whitaker, who was appointed by President Donald Trump after former Attorney General Jeff Sessions resigned in November, is testifying before the House Judiciary Committee for the first time today. The Senate Judiciary Committee advanced the president’s attorney general nominee, William Barr, this week. The full Senate will vote on Barr’s nomination sometime in the coming days or weeks. If it passes, Barr would succeed Whitaker.